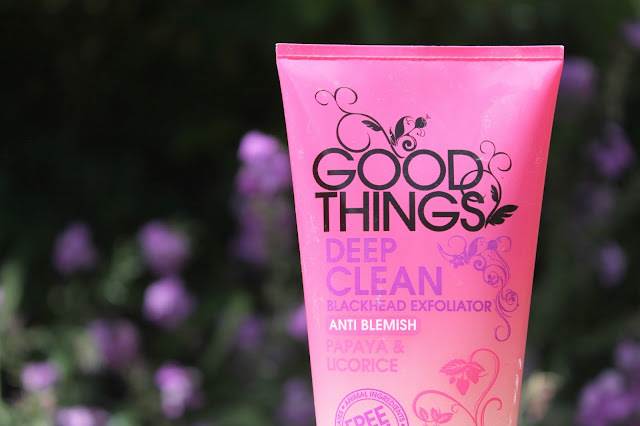 Good Things is a brand that my skin has become well-acquainted with over the years. It launched when I was twelve meaning that its promise of "simple, effective and affordable skincare, with natural ingredients" designed with "young problem skin" in mind was right up my alley. 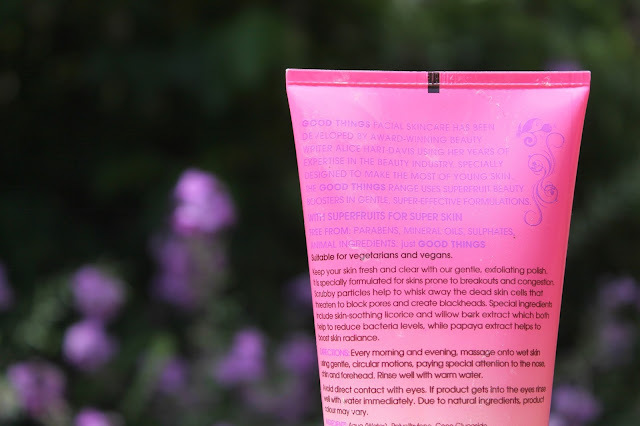 Even now as I've reached adulthood and my interest in the world of beauty has grown and evolved, Good Things is a brand I keep finding myself returning to whenever I'm in need of a good purse-friendly product that will work wonders on my still-problematic skin. As of late, their Deep Clean Blackhead Exfoliator is something I constantly find myself reaching for. The kind people at Good Things have of course created this little beauty with those of us with spot-prone skin in mind and have packed it full of the "superfruit beauty boosters" licorice and papaya. The licorice works to soothe the skin and helps to keep down the bacteria levels whilst the papaya works to boost skins radiance; perfect for the summer months we now find ourselves in. "This gentle, everyday polish contains smooth micro-beads that will whisk away dead skin cells that threaten to block pores and create blackheads". As this product targets it efforts to pesky blackheads I concentrated my usage onto my nose and chin, two of the areas I find sadly to be the most welcoming to congestion. As with all products of this variety you simply massage it onto wet skin in the areas of your choosing and rinse well with warm water before letting its magic get to work. Easy peasy. I'm passionate about only using products that completely pamper my skin and it can be a tricky task to get your hands on an exfoliator that doesn't have 'scratchy' properties (please excuse the lack of a more technical term). Good Things, however, have designed this product to feature the teeniest of particles, meaning that your face gets a bit of T.L.C even whilst it's being exfoliated to perfection. The gentle-touch of the exfoliant also means that it works wonderfully as an everyday scrub, slotting just perfectly into your daily skincare routine. It's time for the results. Whilst this isn't one of those 'wake up the following morning and you'll see a world of difference' kind of products, I've found that if you use it regularly you will start to see an overall hugely-positive change in your skin. I found my pores to end up smaller and less noticeable and those pesky problematic areas to be less oily overall. And ultimately, my skin feels great so what more can you ask for? It's also worth noting that Good Things products contain no animal products, making them a-ok for vegans and vegetarians. Their products are also free from your typical nasties such as parabens, mineral oil and the like. So really, Good Things does indeed do 'good things' with their products. The Good Things Deep Clean Blackhead Exfoliator retails at £4.99 and you can purchase it online from boots here. Alternatively, Good Things is one of those brands you often see popping up down the beauty aisle of good ol' T K Maxx so if you fancy a bargain I'd recommend having a little scout around there.